Case Reports in Anesthesia: A New Paradigm in thinking about DO2? A New Paradigm in thinking about DO2? In this months Anesthesiology Journal, Feiner, J. et al. published an article entitled, "High oxygen partial pressure decreases anemia-induced heart rate increase equivalent to transfusion". I thought it interesting and so read it through. I came back to it a few days later and carefully went through the calculations presented. I quickly realized that they were presenting an entirely new method of understanding DO2 as compared to what I had been taught in my residency training. So I began a review of the literature on the topic of Hyperoxic ventilation in dilutional anemia. I first want to present a brief overview of their work and a few other pertinent publications. Then in another post I want to explore this issue in a different setting. In summary, Feiner et al. found that in patients who were diluted to very low Hgb (about 5.6 g/dL) the HR increased on average 3.9 bpm for every 1 g/dL decrease in Hgb. This increase in HR was reversed by autologous blood transfusion OR with providing 100% oxygen by non rebreather facemask. The study population consisted of healthy volunteers not under General anesthesia. The conclusion is what caused me to gasp. 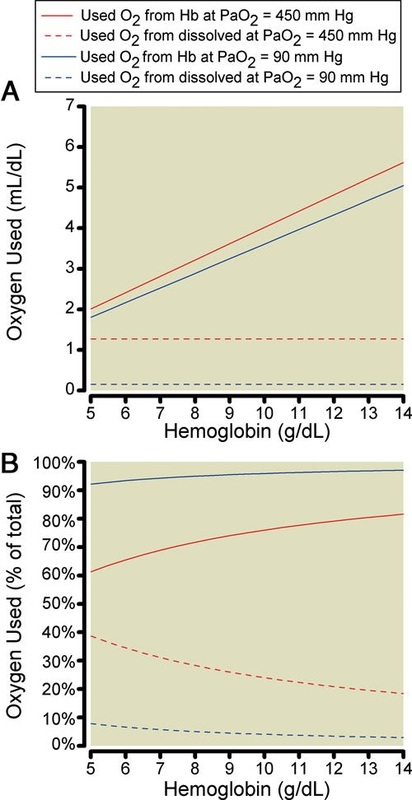 The benefit of oxygen therapy was NOT a result in overall increase in arterial oxygen content (CaO2) but an increase in the oxygen usability (or oxygen that could be utilized), and furthermore, DO2 is not increased, but once again, O2 used does increase. 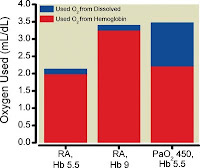 Traditional instruction on DO2 is that it is a function of cardiac output, Hgb saturation, and total Hgb, while the contribution of dissolved oxygen in the blood was irrelevant. A quick calculation makes this seem logical as CaO2 is T Hgb + % sat (of Hgb) x dissolved oxygen (assuming Hbg of 14 g/dL and 98% saturation you get: 14 + (0.98 X 14)=27.72 mL of oxygen, the dissolved portion is then added (105 mmHg X 0.0031)=0.33 mL. In other terms dissolved oxygen represents 1.1% of CaO2 (0.33/27.72). Thus, it seems perfectly logical to ignore this portion of the equation. However, the part of the story that may have escaped getting into the standard training of US docs in this area is that the idea of variable oxygen utilization; oxygen in its dissolved form may be more available for tissue oxygenation than that bound to Hgb in certain physiological states. 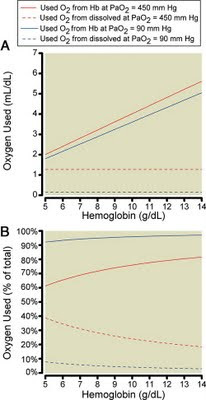 Looking at the graphs to the left, it is obvious that assuming the authors calculations are correct, as Hgb drops, the volume of oxygen used decreases that is bound to Hgb, but not that which is dissolved. The other item to note is that the oxygen used as a percent of total is affected much more at high PaO2. In my next post, I will explore the basic science underlying DO2 and its relationship to clinical scenarios. Finally, in the last post in this series, I will consider how hyperoxic ventilation in anesthetized patients may impact clinical care in low flow states. This is based on a case I did today where the blood pressure dropped to undetectable for a short period of time. 1. Feiner JR, Finlay-Morreale HE, Toy P, Lieberman JA, Viele MK, Hopf HW, Weiskopf RB. 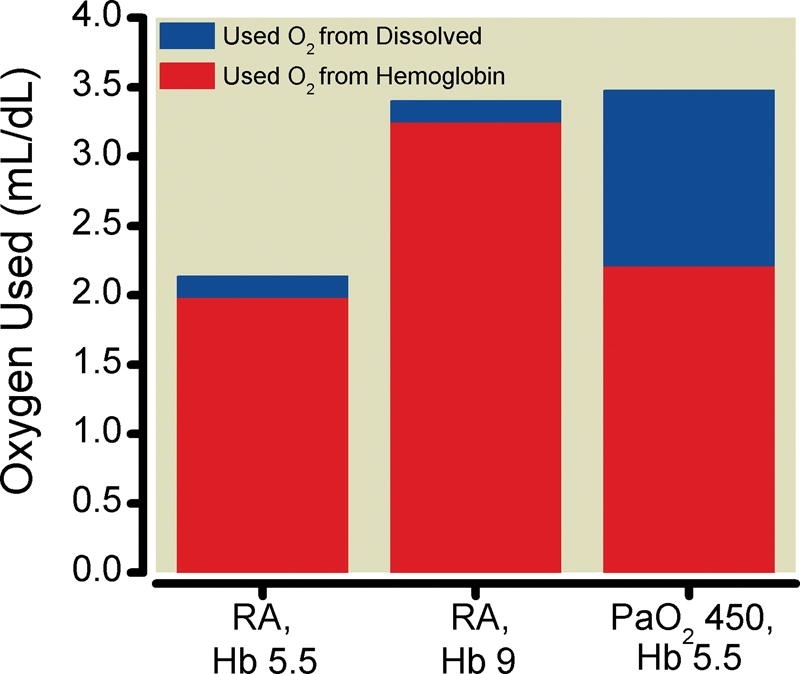 "High oxygen partial pressure decreases anemia-induced heart rate increase equivalent to Transfusion". Anesth 2011;115(3):492.